Jubail, Saudi Arabia, is the location of Sipchem's joint venture petrochemical complex. This industrial city is home to major global chemical manufacturers. The location was to be an important factor in attracting both public and private interest. The production plants of both IMC and Gacic will be linked into the advanced network of distribution that has been developed at the Jubail Industrial Estate. 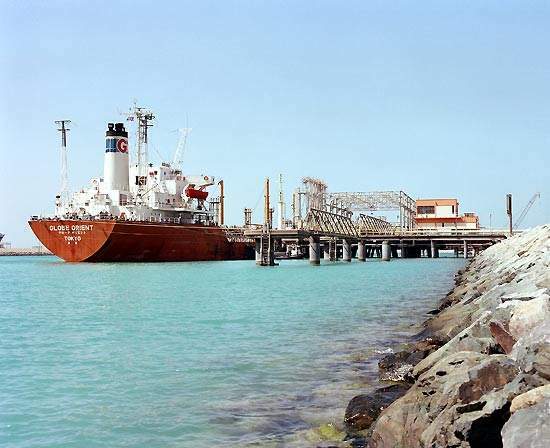 Much of Jubail's modern port and distribution infrastructure has been put in place as a result of the presence of the major producer Sabic. Saudi International Petrochemical Company (Sipchem), a Saudi Arabian joint stock company, has set up a number of joint venture chemical production companies with foreign partners. The companies will produce and market maleic anhydride (MAN), butanediol (BDO), methanol and acetic acid. The new production plants are at Al-Jubail City, Saudi Arabia. The project requires an initial investment of $800m. US-based Fluor Daniel, the engineering and construction unit of Fluor Corporation, was awarded a contract to oversee the development of Sipchem’s petrochemical complex. Fluor Daniel is also providing basic engineering, front-end engineering and design. Fluor Daniel expected to book in the region of $10m for its services on the project. During 2003 Sipchem and Japan-Arabia Methanol Company (JAMC) established a joint venture company, International Methanol Company (IMC), to build a methanol production plant. The facility will have a capacity of 1 million tpa. Sipchem holds a 65% stake in the company with JAMC owning the remainder. JAMC is a Japan-based limited liability consortium. The partners are Mitsui & Co (the major shareholder with 55%), Mitsubishi Corporation, Daicel Chemical Industries and Iino Kaiun Kaisha, each with 15%. JAMC will market 80% of the methanol. The 1 million tpa methanol production plant is being built by Japan’s Chyioda Corporation. The company will execute the project in association with its Saudi Arabian affiliate Chiyoda Petrostar Limited. The lump sum turnkey contract, which includes utilities and offsites, is valued at $240m. Construction of the production plant began in May 2003. The facility is due to start up in the first quarter of 2005. ‘Off-plot’ facilities to support the project, such as main power supply and sea water cooling, are due to be completed in the second half of 2004. Natural gas, the primary feedstock for methanol production, will be supplied by Saudi Arabian Oil Company (Aramco). IMC has selected steam methane reforming and methanol synthesis technology licensed by Jacobs Engineering (UK). The plant will also include proprietary catalysts systems provided by Johnson Matthey and a Methanol Casale Axial Radial Converter. Gulf Advanced Chemical Industries Company Limited (Gacic) was set up as an affiliate of Sipchem to produce speciality chemicals. The new company plant will manufacture butanediol (BDO), tetrahydrofuran (THF) and gamma-butyrolactone (GBL). Gacic claims that the plant, which will produce 75,000tpa of BDO, will be the largest of its kind in the Middle East. 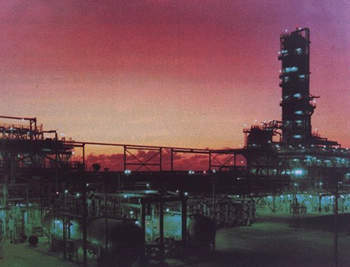 The BDO plant is scheduled to start up in the fourth quarter of 2005. Investment costs are in the region of $220m. The beginning of 2004 saw Gacic receive a loan of $107m towards the construction of the 75,000tpa BDO plant. The loan was provided by the Saudi International Development Fund. Gacic has entered into an agreement with Aker Kvaerner which will see the Anglo-Dutch company provide engineering, procurement and construction services for the BDO plant. Aker Kvaerner said that when the contract is fully realised, its involvement in the project would be worth in the region of $140m to $150m. Work is under way and the plant is expected to start up in the fourth quarter of 2005. Proprietary technology provided by Huntsman, will be used to convert the butane raw material to maleic anhydride (MAH). The MAH will be used as the feedstock to produce the BDO, using technology provided by Davy Process Technology. IMC and Gacic awarded Saudi Arabia Kent a contract to provide feedstock, product and port facilities for production plants on the Al-Jubail complex. The contract was awarded on an engineering, procurement and construction (EPC) basis. The contract covers several areas including building methanol and BDO pipelines and port tank farms at King Fahd Industrial Port, Al-Jubail. Completion is slated for July 2004. Sipchem’s affiliate Gacic has signed a long-term offtake agreement with US-based Vinmar International. The agreement covers 45,000tpa of BDO and THF. The agreement is valid for an initial period of seven years from the beginning of commercial production. Several other companies are lined up to market Gacic’s BDO. The majority of the methanol produced (80%) will be marketed by the IMC joint venture partner JAMC. Intelligroup Asia, a wholly owned subsidiary of Intelligroup, along with its local partner in Saudi Arabia, Zamil Birla Technical Services Co, was awarded a contract by Sipchem to provide a customised mySAP solution. This solution will integrate and automate Sipchem’s core processes, critical to Sipchem’s e-business strategy. Intelligroup stated that the mySAP solution would facilitate real-time electronic collaboration of employees, suppliers, customers and partners. The system will also offer the capability to act across the entire Sipchem value chain from the buy-side to production to the sell-side. Saudi International Petrochemical Company (Sipchem) was established to set up petrochemical and other hydrocarbon industries using local resources, infrastructure and expertise wherever possible. The company was originally established in 2000 with Saudi Riyals 500m ($133m) of fully paid-up capital. Sipchem has subsequently raised its capital to $173m. During the final quarter of 2003, the Bahrain-based Islamic Development Bank Infrastructure Fund acquired a 23% stake in Sipchem for $48 million.